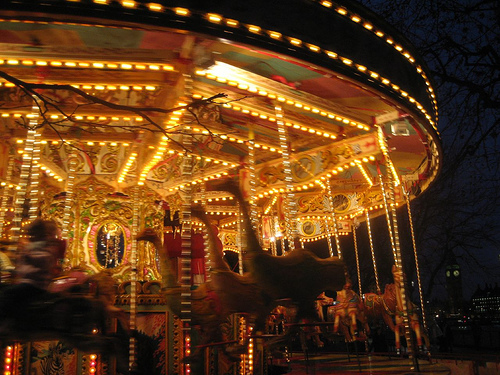 So I’ve decided to introduce a new feature to this blog: carousels. Essentially, this is where I send you on a trip around the internet. Special places that helped define my week, highlights that include fascinating things to read, look at, listen to, watch. Things to inspire and thoughts to turn over. Enjoy! I watched my first Jean-Luc Godard film, Masculin, Féminin. I’m still uncertain how I feel about it, but I liked just being able to sit down and listen to all the conversations taking place. You can watch the whole thing on Youtube, and it has English subtitles. A strange short story: The Fisherwoman’s Daughter. A short poem by Allison Titus: Inclement. I really wish Maurice Sendak were my grandfather so we could be bitter curmudgeons together. Here’s a video on his work, childhood, and inspirations. More poems to look at that left an impression: Flowers in Stone, Gender Studies, Advice for the Manic / Instructions for Grieving. You can also listen to some of the authors read their works. Watching this music video by Gotye should be used to gauge humanity. If you cry, congratulations! You’re not a robot. Not that there’s anything wrong with robots, of course. I started reading Zazen by Vanessa Veselka, which I’ve been seeing everywhere around the internet. From the reviews, it seems to be pretty difficult to define. You can read it in its entirety on Red Lemonade. I read The Depressed Person, a genius essay by David Foster Wallace, which is so powerful and convincing that it literally caused me to have a physical feeling of revulsion. Godard is one of my favorites, but only because I have this love/hate relationship with his work. Like a good friend, I don't always agree with every single thing that he is saying, but goodness… sometimes when he does get it right the message is always beyond beautiful. (It doesn't help that all the beautiful women at the time were in his films.) I am sort of surprised you're just now getting into him. What took you so long? Aha! Une Femme est une femme holds a dear place in my heart (not only because my name is in it, though!) but I'm not sure it is on Youtube? You should watch it and tell me what you think. It is a lot more lighthearted and sweet. I will be looking forward to more posts like this. I can definitely see why Godard's films wouldn't be for everyone's taste. I'm still not sure how I feel, but I'll definitely check that one out and let you know. Hey, Glen! Thanks for letting me know. I saw your poems in Sundog. Such a terrific issue!